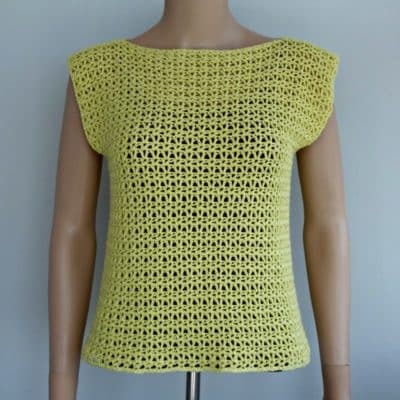 The V-Stitch Crochet Top pattern is available in women’s sizes from XS to XL. However, a stitch multiple is provided to help you adjust this design to any size you need. You could easily increase for an over-sized beach cover-up. Or, increase the length for a nice breezy summery dress. Along with a waist belt of your choosing you could wear it to any summer occasion from the beach to a wedding. Since this stitch pattern is so easy to adjust in size, you can basically use any yarn and hook size that you have on hand. However, I do recommend that you use a cotton or cotton blend to help keep you cool in the summer weather. And the thinner the yarn, the more details you’ll have in the finished project. 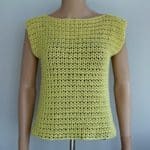 The cotton yarn along with the openness of the v stitch, makes it perfect for summer weather. It’s nice when worn over a spaghetti strap, but wear it any way that you like. Shown is the small size modeled on an adult small mannequin. The stitch pattern is the same as this dishcloth pattern. But it’s worked in a finer yarn, so it turned out a lot prettier. Purchase an Ad-Free PDF copy, or scroll down for the free version. 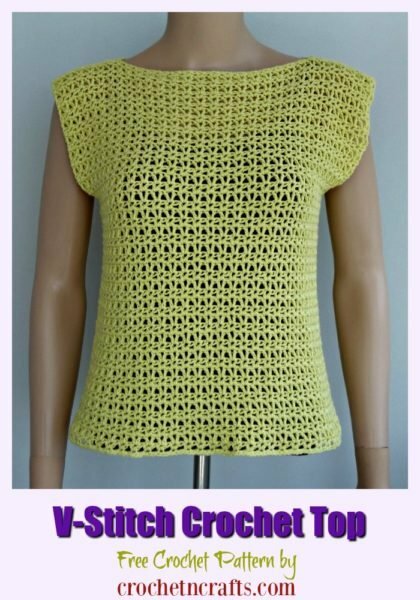 The crochet top is a simple and mindless pattern allowing you to relax and crochet while watching T.V. or while hanging out at the beach. It’s the v-stitch pattern; one row is done with the half double v stitch and the other is done in the double crochet v stitch. Not only is the stitch pattern easy to remember, but it also gives you a nice stretchy fabric in both directions, which makes for a super comfortable garment. Pattern is given for XS. Changes for sizes S, M, L, XL are given in parenthesis. Increase/Decrease the width as desired in any multiple of 3. As for length, do more or less repeats of Rows 3 and 4. Garment is worked in two pieces from bottom up; front and back. Each piece is worked identical. Block both pieces to dimensions before seaming. Adjust shoulder and side seams for a custom fit. Leaving a 20″ tail for side seams and with G hook, Ch 81, (90, 99, 111, 120) or any multiple of 3 to adjust the width. Row 1(RS): With E hook and working into back bumps, sc in 2nd ch from hook and into each ch across. Turn. [80, (89, 98, 110, 119)] sts. Row 4: Ch 1, hdc in first st, hdc v-st in first v-st and into each v-st across. Hdc in last st. Turn. Rows 5-50, (52, 52, 54, 56): Repeat Rows 3 and 4 until you have reached a desired length. Fasten off at last row leaving a 10″ tail for shoulder seams. Block both pieces to dimensions in schematic. 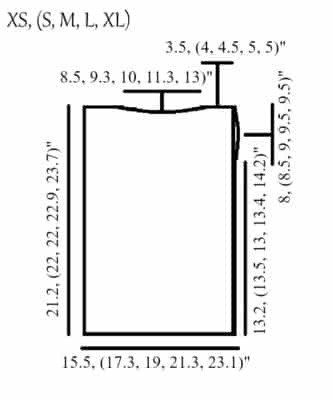 Sew shoulder seams 3.5, (4, 4.5, 5, 5)” on each side leaving an approximate 8.5, 9.3, 10, 11.3, 13)” opening for the neck. Sew Side Seams on each side from bottom up leaving an 8, (8.5, 9, 9.5, 9.5)” opening for the armholes. Optional: Add a single crochet edging along arm openings.